On 5 and 6 February 2014, Emergency Services FCC arranged lifesaving info sessions in West, Newton and Shirazi Halls. Fl. Lt. Abdul Rehman (Assistant Warden West Hall) said that students must save the Emergency Services numbers. Prof Suneel Samuel (Assistant Warden Newton Hall) said that one should know the basic skills to save some one’s life until advance medical care arrives. Ms Amber Mall (Warden Shirazi Hall) said that we should have these trainings to deal with emergencies at home in the hostels. 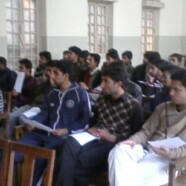 Students expressed their interest to have further trainings. You can also visit Emergency Services office from 9:00 am till 5:00 pm.